It started the second time around with friends and neighbors clamoring for more. The King brothers had been discussing it for a long time, and this gave them the incentive to revive their grandfather's tradition without any hesitation. Milk delivery, that is. Jan and Jeff King start off their morning 3 days a week at 5 am to start milk deliveries. 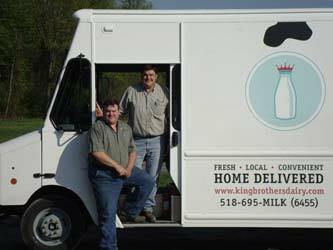 In April 2010, when King Brothers Dairy began in earnest, the brothers were only delivering a day a week from their farm in Schuylerville. Word has spread of the local dairy and produce - "a farmers market on wheels," as Jan describes it - and the brothers have had to split off their delivery routes and days since then. It's all worth it, though, for the smile it brings to everyone's faces. For maybe a few cents more than what you would pay at a grocery store, you can have - conveniently delivered to your home - locally produced dairy, among other products. The satisfaction of bringing their friends and neighbors fresh milk and hearing people say things like how they remember getting milk when they were younger, or how great it is that they can get local goods and produce so easily - that satisfaction is priceless. But what makes this milk so special? It is real milk - a vast improvement on the milk you find on the shelves. 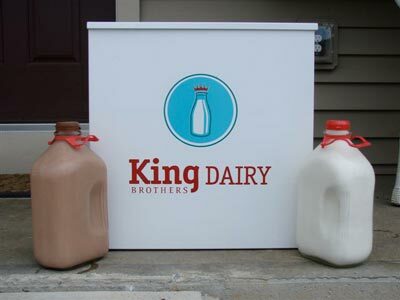 Most times, the King Brothers arrive to your door less than 24 hours after the milk has been processed. Glass bottles help retain cool temperatures and amazing taste. It's fresher - the milk is pasteurized, though not for extended shelf life. All this makes a much more flavorful milk than what the average Joe would pick up at the local supermarket. Photographs used with the permission of King Brothers Dairy.